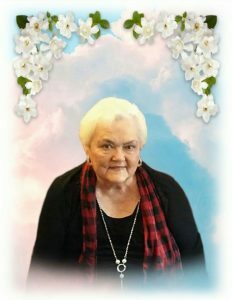 Lynn Louise Schaumburg Collins (79) of League City, TX went home to be with her Lord on Saturday, February 9, 2019 at 12:00PM. She was surrounded by her family and is now at peace. Lynn was born on December 5, 1939 in New Orleans, LA to Margaret and Edward Schaumburg. She was the oldest of 4 children and the oldest grandchild. As the first-born she grew to be the Matriarch of the Shepherd-Schaumburg-Collins Family. Family was the most important thing to Lynn. She Married the Love of her Life, Michael A, Collins Jr. on January 27, 1959 and was happily married for 60 years. They had 5 children, 9 Grandchildren, and 2 Great-Grandchildren. She was a devoted wife, loving and caring mother and a devout Catholic. She bestowed unconditional love on her children and grandchildren and taught them the life-lessons she learned at their beloved playground, Bunny Friend Park. Lynn excelled in sports, academics and school government. She was revered as the Queen of Bunny Friend Park where she was the Ping-Pong Champion and Beauty Queen. She competed in several sports and won New Orleans City Championships representing Bunny Friend Park and the CYO. Lynn even met the Love of Her Life for the first time at the park and their love story was sealed with a kiss after a King Cake Party. She Graduated Francis T. Nicholls High School in 1958 as the President of her Class and the Head Majorette of the Fighting Rebels Band. She marched in Mardi Gras Parades and performed at The Sugar Bowl. Lynn became a Certified Respiratory Therapist and then later was the Manager of Coordination of the Payload Specialists at NASA. She traveled the world from the Eiffel Tower to the Sultan’s Palace and at every Space Shuttle launch with her Payload Specialists. But Lynn’s greatest achievement was her family. And everyone she loved, she treated and included as family. Lynn loved, and was loved and will be Missed…. She is survived by: Her husband: Michael Ashton Collins JR. Her children: Michael Ashton Collins III (Lynn), Margaret Alice Collins Radvansky (Fred) and Sean Patrick Collins (Cindy), Her grandchildren: Shauna Collins Harvey (Zack), Michael Ashton Collins IV (Lauren), Katy Balynda Collins, Cole Charles Collins, Ashton Fredric Collins Radvansky, Zachary Ryan Collins, Mackenzie Alyssa Collins and Her great grandchildren: Harris Michael Harvey and Collins Claire Harvey , Her Siblings: Edward Schaumburg (Linda), Susan Barrios (Don), and Debra Truxillo (Tommy) And many nieces, nephews, cousins and friends we all loved her and will miss her deeply. Funeral Mass will be held at 10:30am Friday, February 15, 2019 at St. Mary’ Catholic Church, 1612 E. Walker Street, League City Texas 77573. Interment at Mount Olivet Cemetery in Dickinson, Texas. We are profoundly saddened to hear of your mother’s passing.May God Bless and keep you and your entire family. Very sorry to hear this news. My sincere condolences to Mike and the family. My prayers are with you all in this time of need. Lynn was a great pleasure to be around. She had a very special way about her. It was a joy to be in her company. She will be missed by many, but never forgotten. To Ms. Lynn Louise’s family, I’m deeply sorry for your loss. Our Heavenly Father Jehovah promises that you will see her again very soon. Acts 24:15, John 5:28,29. She will also be in perfect health Revelation 21:1-5.
some of our best memories at the Kemah house! She will truly be missed by so many. So many happy memories and times spent with the Collins . Sorry to hear about Lynn. She was always so much fun at the SSH Country Club Friday night Happy Hour. Cheryl and I have fond memories of our time with you and Lynn at so many social events. Our thoughts and prayers are with you and your family as you adjust to life without such a special lady. I am so sorry for your loss. The few times I met her she was so nice to me.